In the digital era where the sheer volume of data any single worker needs to handle can prove to be overwhelming, working with just one monitor just doesn’t cut it anymore. Stock traders, video editors, online marketers – these are just some of the careers that have seen increased productivity and efficiency with multiple monitors. Most people who have worked with up to three monitors have also realized the value of investing in a good triple monitor stand. You may ask: why should you get a triple monitor stand? Don’t the monitors come with their own stands? Well, you are right. All monitors come with their own stands. However, the problem with the stock stands that come with monitors is that they just aren’t very good. Most stock monitor stands come with minimal functionality. Yes, they hold the screen upright on your desk and may have limited swivel or panning functions, but that’s about it. In terms of options for viewing and ergonomics, nothing can beat the intelligently engineered third-party monitor stands, such as those we have included in this article. If you’re looking for the top triple monitor stands, then you have come to the right place. We will help you go over the qualities that you should look for when shopping for a triple monitor stand and give you our list of the top 4 triple monitor stands available today. What should I look for in a triple monitor stand? Before you go looking for your ideal triple monitor stand, it would be prudent to think about what exactly you are looking for. You can start by taking a look at your current monitors, or those you plan to buy. What are the sizes and weights of these monitors? Take a look at the back of the monitor and check if there are four screw holes arranged in a rectangular formation. Armed with this information, it’s time to pick the right triple monitor stand for you. Before you go shopping for a triple monitor stand, you’ll need to know your screen sizes. Although most triple monitor stands can accommodate a variety of screen sizes, not all of them are made to fit, say, three 27-inch monitors. 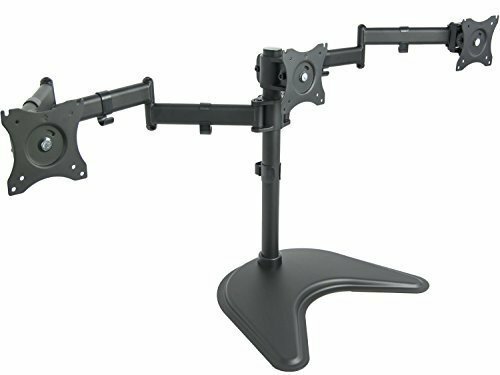 Third party monitor stands offer a variety of mounting positions with the goal of providing a more ergonomic workstation. They do this while saving on space and keeping monitors anchored on a secure and durable structure. The most basic mounting position is the freestanding mount, which essentially looks the same as your stock monitor stand. However, most third-party freestanding mounts are much more flexible than their stock counterparts. A good freestanding mount will let you adjust the height of your monitor to eye-level, allow some panning and tilting, and even has provisions to rotate the screen to a landscape format. For an option that provides more desk space, you can go for a monitor stand that uses a side-clamp desk mount. 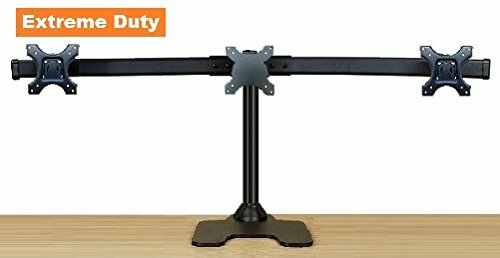 Instead of resting on the surface of the desk, this monitor stand is anchored on an arm that clamps to the side of your desk. This is a semi-permanent setup that is quick and easy to install, although it may not be appropriate for some types of desks. Another option that substantially saves on desk space is the through-the-desk grommet mounting, where a heavy-duty bolt that goes through a hole in your desk secures the weight of the triple monitor setup. This is a more permanent setup that may require that you drill a hole in your desk, but it is much more secure and designed specifically to withstand greater weights. Finally, you may opt for a wall mount. This is a very stylish mounting strategy which completely frees up your desk space. However, it is a very permanent solution which will require you to drill holes in your wall. Not all office or home spaces may be amenable to the modifications needed to set up a wall mounted monitor. A huge selling point for triple monitor stands is the flexibility in terms of display and ergonomics that their setup provides, resulting in a workstation that is customized to the user and work being done. Triple monitor mounts should deliver on a few basic functions, such as panning and tilting. Many studies on office ergonomics have shown that having a monitor at eye level is best for your posture and reduces the stress on your neck, so having a triple monitor stand with height adjustment is a significant advantage. 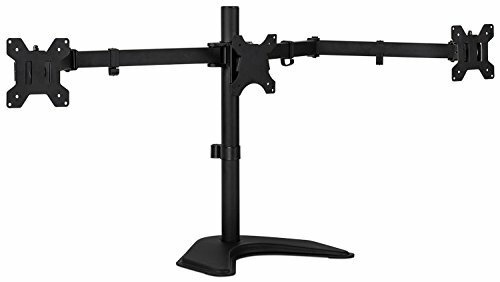 Some monitor stands also provide a rotating function, which you might find useful when viewing certain documents or doing some data entry work. Another factor you may need to consider when looking for the best triple monitor stand is the weight that it will have to carry. Carrying the weight of three, large-format monitors is certainly no easy task, so you will have to go with something made from very durable material and a heavy-duty build. Most third-party monitor stands have specifications of the weights that can be carried by each individual arm. Unfortunately, using a three-monitor setup limits your choices in mounting options. Because of the weight of the three monitors, it is usually best to pick a triple monitor stand that uses either a freestanding mount or a through-the-desk grommet mount. Both these mounting options provide maximum security in terms of not falling over. After all, you wouldn’t want to have broken monitors just because you picked your triple monitor stand poorly. One last thing to consider is to make sure that your monitors are VESA-compatible. The VESA 100 mounting system is standard for all third-party monitor stands. However, the same cannot be said for all types of monitors. Smaller and cheaper monitors, as well as those with curved backs, are oftentimes those that are not VESA-compatible. The Mount-it! Triple Monitor Stand is a heavy-duty mount that can accommodate 19, 20, 21, 22, 23, and 24-inch monitors. If you have 27-inch monitors, you can still use this mount as long as one monitor is in portrait mode. For secure mounting, this stand provides two options: you can use the heavy-duty metal base as a freestanding mount or use the included grommet mechanism to secure the stand to your desk. Each arm of the triple monitor mount can carry up to 22 lbs. This triple monitor stand features individual monitor height adjustment, swivel function of up to 360 degrees, an integrated cable management feature, and full-motion, double-link swing arms. The possibilities are endless, so you are sure to find the most ergonomic setup for you. In spite of its rich array of features, some users have indicated that this triple monitor stand is a little too top-heavy, making it unstable and easy to tip over. Some components also don’t come together as smoothly as expected, so some small adjustments and elbow grease may be necessary to get the best out of this triple monitor stand. If you are don’t intend to use very large monitors and are working on a budget, then the Mount-It! Triple Monitor Stand may be the perfect choice for you. The EZM Deluxe Triple Monitor Mount is designed to support up to 28-inch monitors with either VESA 75 or VESA 100 fittings. It is essentially a freestanding mount with a heavy metal base, but EZM provides the tools and instructions for the option to bolt the base down to your desk. This will entail drilling holes on your desk, so your mileage may vary. In any case, the heavy metal base provides sufficient counterweight even for a 3-monitor setup. Each mounting head features tilting, swiveling, and rotating functions. Height adjustment is a little limited for this triple monitor stand; you can only adjust monitors to four pre-determined positions, and all 3 monitors will have to be adjusted to the same height. This triple monitor stand may not be as infinitely adjustable as other models but makes up for it with superior durability and stability. If stability is your priority, then you can’t go wrong with the EZM Deluxe Triple Monitor Mount. The Planar Triple Monitor Stand can accommodate screen from 17-inch up to 24-inch, with each mounting arm able to hold up 17.6 lbs of weight. It features both VESA 75 and VESA 100 connecting options. 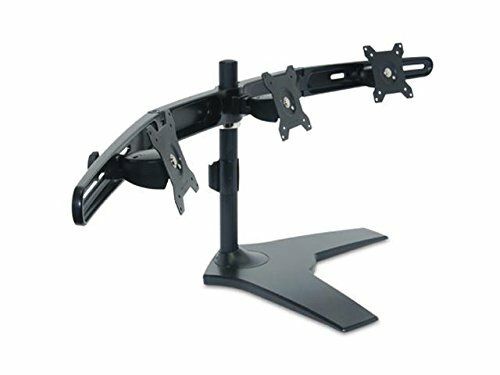 Individual mounting heads of this triple monitor stand also features functions such as 90-degree rotation, 20-degree tilting, and 20-degree swivel. The height of the monitors is adjusted via a sliding rod with a maximum height of 13 inches. Although there are no pre-determined height positions, all three monitors still have to be adjusted to the same height. This is a freestanding triple monitor stand with no other mounting options. Despite its no-frills design, this triple monitor stand has received great feedback for being sturdy and reliable, on top of being easy to set up. If you are looking for a low-profile triple monitor stand that delivers in the reliability department, then the Planar Triple Monitor Stand is an excellent choice. The VIVO Triple Monitor Mount is designed primarily for 13-inch up to 24-inch monitors. 27-inch monitors will fit but will be restricted in terms of angle adjustments. It is a freestanding mount, with each mounting arm designed to carry up to 17.6 lb of weight. It is made with high-grade steel and aluminum, providing a durable and stable frame for all your precious monitors. Each arm of this triple monitor stand provides a wide range of adjustments: a 90-degree tilt, 90-degree swivel, and a full 360 degrees of rotation. The height of each monitor can be adjusted individually along the central rod. A unique feature of this triple monitor stand is its articulating jointed arms which give each monitor a wider range of motion. When to comes to customizing the workspace, this triple monitor stand seems to be ahead of the pack. In spite of its promise of a durable build, feedback on this triple monitor stand has indicated that using it with 24-inch monitors or larger may raise some issues with stability. The individual mounting heads may sag under all the weight, making the whole setup unstable. If you are buying this triple monitor stand for its customization capabilities, we recommend that you only use it with smaller monitors, so you don’t run into stability issues. When looking for a triple monitor stand, there are certain factors you need to consider. These include the size and weight of your monitors, the desk you will be using, how important ergonomics and customization are to you, and whether you can drill holes on your desk or your wall. In any case, having the best triple monitor stand will go a long way towards helping you maximize your productivity and efficiency.